At the suggestion of a good friend while on a beach vacation in Mexico, Kathleen reluctantly signed up on OkCupid to meet someone new. “She tried to persuade me by saying she was also online and there was no commitment if I didn’t like it,” says Kathleen. “At first, I told her I was totally against putting myself back out there and felt I was fine with being single for a little while longer, but once we returned from our vacation and the reality of being back in cold New York hit, I realized maybe I did want to see if there was any potential in the online dating world.” So, Kathleen made a profile, added her pictures, and waited. She received messages right away but was immediately uninterested. “I texted my friend to tell her that I had signed up, but it just wasn’t going to work out,” says Kathleen. When she told her she was only on it for 15 minutes, “she laughed and told me I clearly needed to give it more time.” Kathleen then went back to her computer and a minute later James messaged her. “The second the bubble came up with his photo and a message, I knew this was going to be something,” says Kathleen. On one of their first dates, James took Kathleen to see her favorite singer Jason Aldean perform. “Going to country music concerts quickly became our thing,” says Kathleen. For their one year anniversary, James surprised Kathleen with a trip to Mohegan Sun to see Jason Aldean in concert. “We had front row tickets to a VIP show before the concert!” says Kathleen. Prior to the VIP show, Jason’s assistant came around with index cards for a Q&A with Jason and his fans. Kathleen and James decided on a summer wedding, starting it off with their ceremony at St. Agnes Cathedral in Rockville Centre. 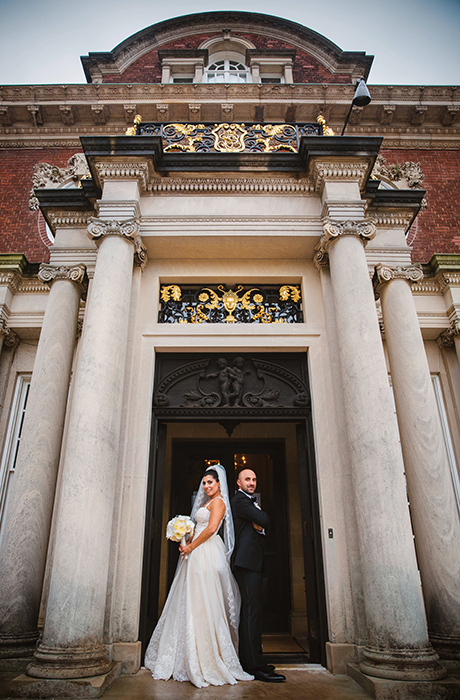 Kathleen wore an ivory Badgley Mischka mermaid gown and James stood beside her in a navy tuxedo from Foresto’s. 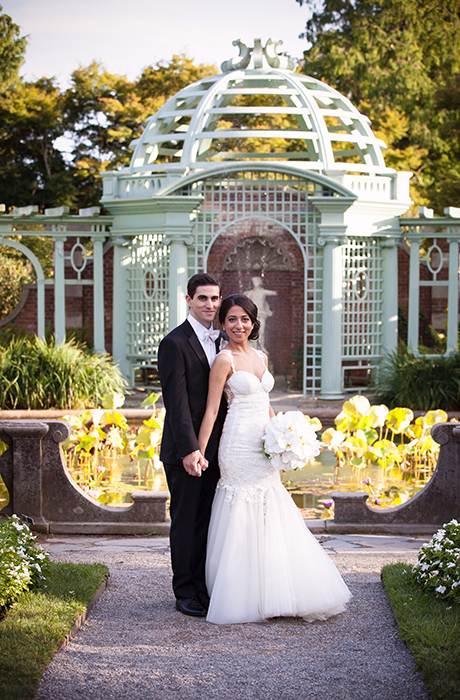 After the ceremony, the couple celebrated their nuptials at Larkfield in East Northport. Guests were greeted by a donut wall featuring a variety of chocolate and vanilla donuts, all with blush-colored frosting dusted with gold, incorporating the two colors from their wedding palette as they exited the reception. Many love stories begin with a well-meaning friend who decides that two people would be perfect for each other. In this case, such an introduction a little over seven years ago finally culminated in Jessica and Fabrizio’s magical wedding celebration. 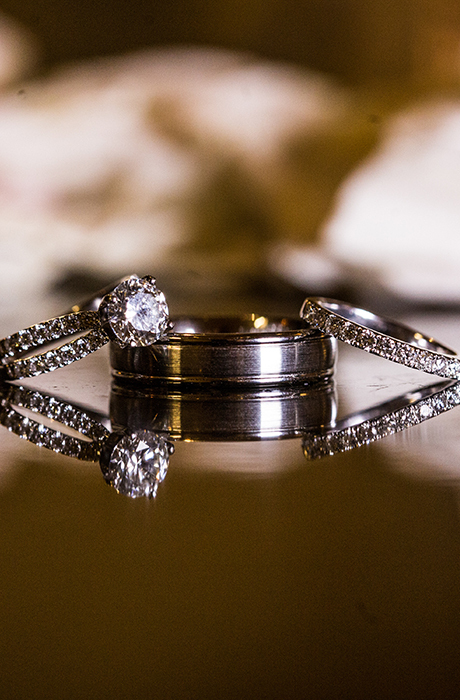 Jessica was completely thrown off guard, but quickly answered with a resounding “YES!”, and the couple soon began to make wedding plans, starting with elegant black-and-white invitations. Jessica and Fabrizio were wed at the Garden City Hotel, with day-of-wedding photos also taken in the streets of Garden City to capture a real local vibe. Jessica and Fabrizio were married by a family friend, Pastor Bob. 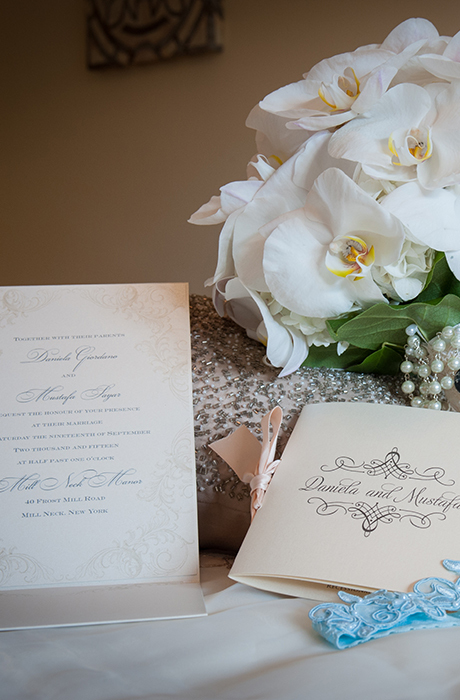 The ceremony was packed with both family and friends and featured dim lighting, pillar candles and a fragrant flower wall made up of white orchids and hydrangeas. Jessica was dressed in a satin mermaid-style gown designed by Ines Di Santo, boasting a sweetheart top, a long train and an open lace back. The simple white tulle veil fell symmetrically below the waistline, and her bridal bouquet included a combination of pink and white roses, embellished with subtle crystals. The bridesmaids also wore mermaid style, off-the-shoulder gowns, in black. Fabrizio and his groomsmen wore black tuxedos with black ties, designed by a custom clothier. 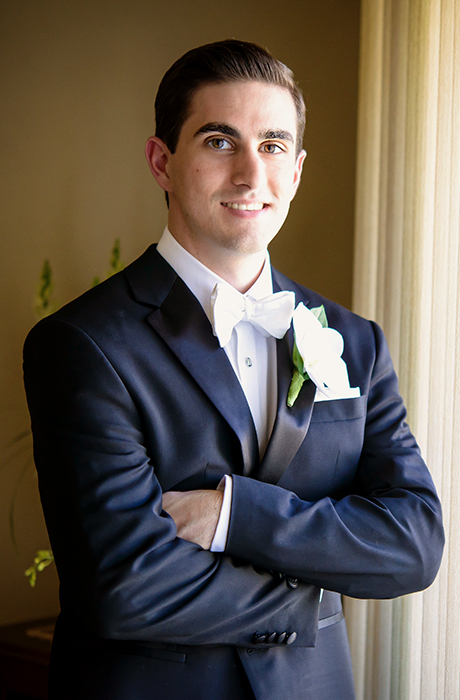 White rose boutonnieres completed this classic look. The unforgettable reception followed the ceremony at the same venue, the Garden City Hotel. With 275 guests in attendance, the overall mood was one of romance and elegance. Jessica adds, “The amount of love, happiness, and energy we felt was even more than we could have imagined. All of our guests were dancing throughout the entire night, thanks to Unique Entertainment, and we must say that those were some of our favorite moments of the evening.” The décor for the reception was creative, with three different styles of centerpieces for the 26 tables —all filled with hydrangeas, plus pink and white roses, and draped with crystals to match the bouquets. The cocktail hour started off with pasta, meats, an antipasto, and seafood. The full menu further included 10 different food stations, including pasta, seafood, carving and slider stations, and even Asian and Mexican fusion. 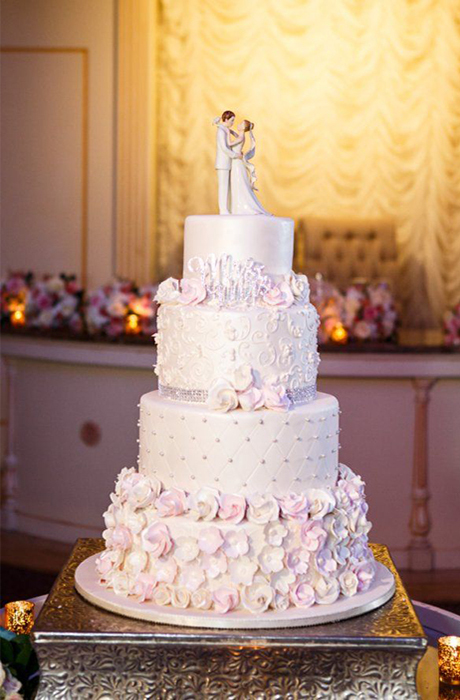 Everyone was also delighted with the cake, a beautiful five-tiered cannoli masterpiece set off with pink roses. To top things off, there was a specialty cocktail station, featuring Banana-Infused Jameson. The happy couple went on to have an amazing two-week honeymoon in Italy, where they visited Rome, Tuscany, Florence, the Amalfi Coast and even Fabrizio’s family in Durazzano. 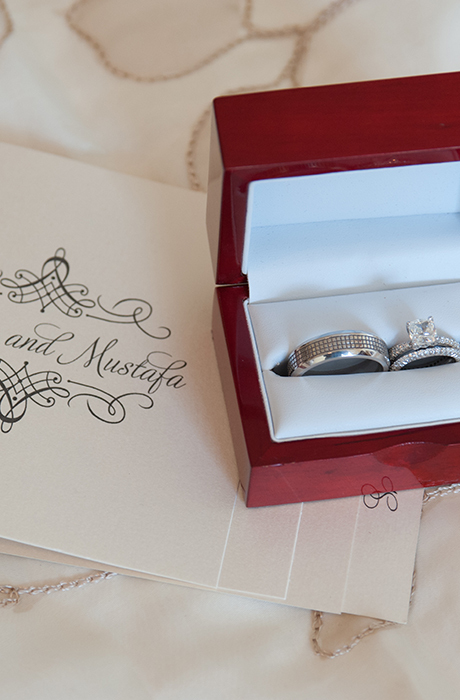 For other couples planning their weddings, Jessica suggests that you just have fun with it, and all of the details will fall into place. In 2010, Frank and Jennifer met at what they thought would be a regular birthday party for a mutual friend. When it came time to leave the party, Jennifer sat on Frank’s lap in the taxi to “make extra room.” They stayed in touch and became good friends, but it was nearly a year before they realized that this taxi ride was the beginning of such a significant relationship. And just like that, less than two years later, Frank and Jennifer sent out save the-date bookmarks, utilizing photos from their engagement shoot with Tony Lante Photography. 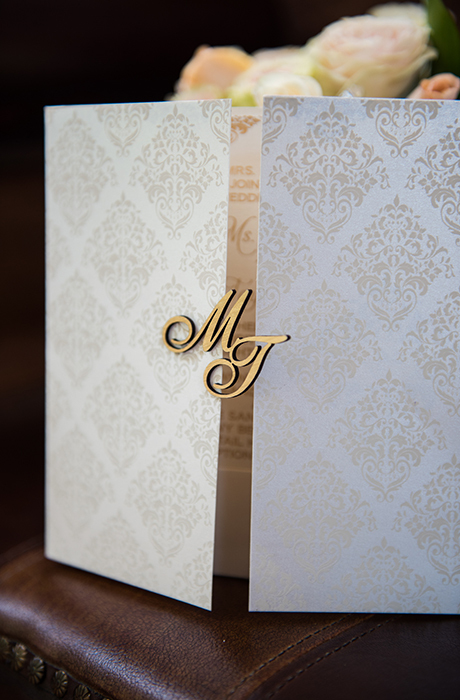 The invitations were a classic taupe with a chandelier design. 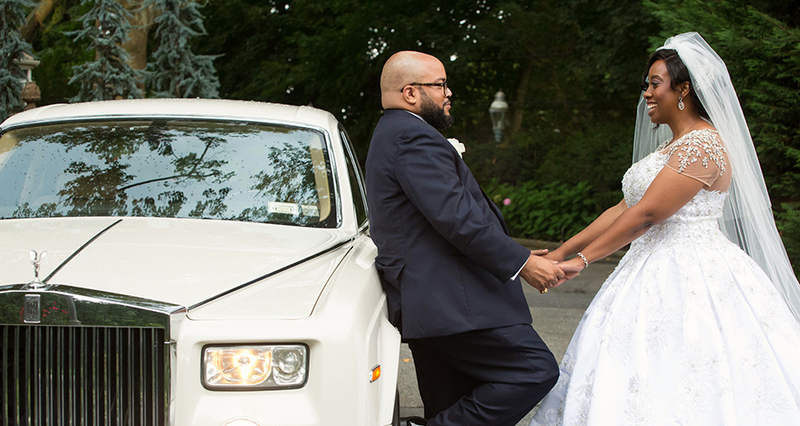 The ceremony was held at Saint Isidore Church in Riverhead, New York. The procession included seven bridesmaids and nine groomsmen, along with one flower girl. Jennifer’s father escorted her down the aisle to “Jesu, Joy of Man’s Desiring,” and Jennifer’s godmother played all the procession songs on the violin. Father Gregory Rannazzisi, a close friend of Frank’s, officiated the ceremony. Jennifer was dressed in an A-line Anna Campbell dress, handmade in Melbourne, Australia. Her white cathedral style veil was from Village Bridal & Boutique, and to complete the look she wore silver Badgley Mischka shoes. 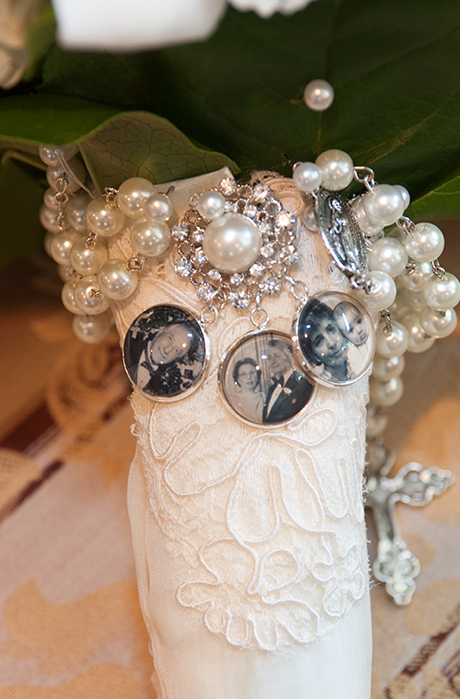 Her jewelry was made by her father-in-law, and her bouquet consisted of cascading orchids with white and ivory roses and eucalyptus. The bridesmaids wore different styles of Bill Levkoff dresses in petal pink, champagne, and cashmere. The maid of honor wore a Hayley Paige pink dress with rhinestone straps. The groomsmen wore navy-blue suits, while Frank wore a darker blue and all with white polka-dot and navy-blue ties. The wedding reception was at Giorgio’s, for 215 guests. The 19th-century French style inspired their “Phantom of the Opera” vs. “Beauty and the Beast” theme. 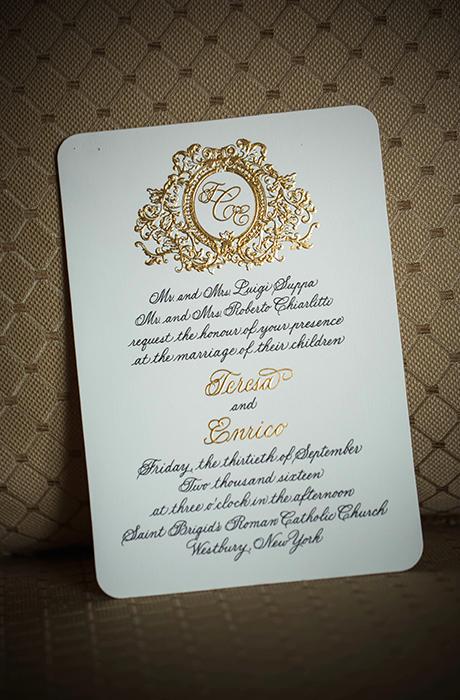 The color scheme included pink and ivory, plus gold and white accents. The style was minimalistic, with different centerpieces of cylinder candles, Sahara roses, and eucalyptus, along with repurposed books as table numbers. The favors were olive oil with rosemary, all shipped from Frank’s family olive farm in Italy. The cocktail hour included short ribs, along with sushi and mashed potato bars, followed by the full reception menu of filet mignon, pistachio crusted salmon, parmesan-crusted chicken, and Long Island Duck. Signature cocktails included a twist on both the Cape Cod and the Old Fashioned. The wedding cake was 4 tiers, each tier with a different mix of vanilla cake, chocolate fudge, chocolate cake and vanilla pudding, topped with vanilla buttercream. The first dance was “Sparks” by Coldplay, followed by an evening full of dancing, along with a custom photo slideshow. In addition to the DJ from Vivo Entertainment, the couple also hired a Frank Sinatra singer. Frank is a first-generation Italian, so they were sure to incorporate classics like “Ti Amo” by Umberto Tozzi and “L’Italiano” by Toto Cutugno. They arrived and departed in a coach bus from M&V Limousines. Four months later, Frank and Jennifer took an 11-day European cruise for their honeymoon. They went on to Italy, France, Spain, and Gibraltar. For other couples who are quickly approaching their wedding days, Frank and Jennifer suggest that they do their best to live in the moment, forget about what could go wrong and just breathe. Who knew that going out to dinner with the groom's friend and the bride's (who were dating) would turn into a true romance, for Teresa and Enrico. In fact, both couples are now married. This is one dinner date that turned out well for everyone. Teresa and Enrico, got engaged during his birthday weekend. After dinner at the Basil Leaf Cafe, the two met his family for cake and coffee. When Teresa grabbed a cake box from her refrigerator, Enrico told her, "Oh no, my mom is going to be upset. This isn't the right cake." When she looked at the dessert she saw it said, "Will you marry me Teresa?" All of their family and friends surprised the couple that evening at his parent's house. "He made his birthday about me which was truly special," said Teresa. 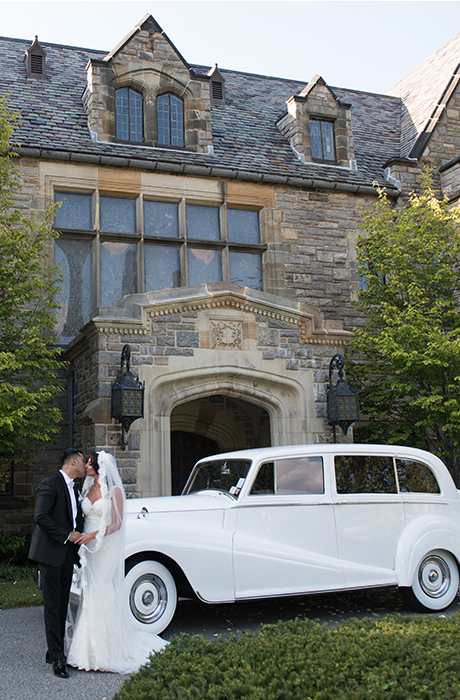 Their wedding was on September 30th, at St. Brigid's Roman Catholic Church. The couple had Church. The couple had an Italian-American full Mass with Italian and English songs. As guests entered the church they heard John Lennon's "Grow Old Along With Me." "Ave Maria" was sung as Teresa and Enrico brought flowers to the blessed mother during the mass and their mothers lit the Unity Candle to the song "The Prayer" by Andrea Bocelli and Celine Dion. 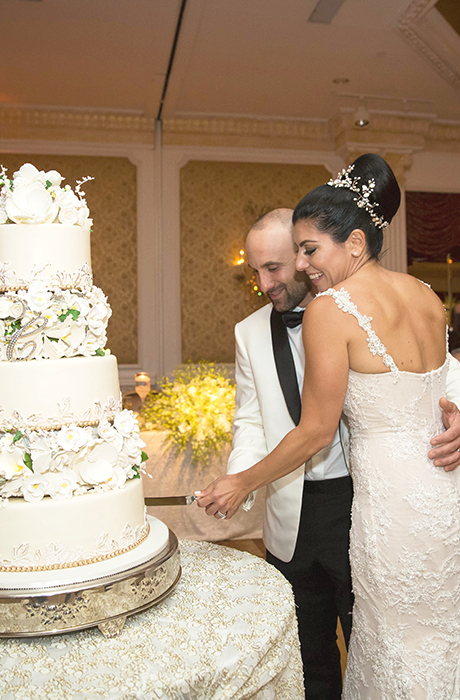 Teresa wore a custom Galia Lahav Crystal dress. The gown was made of a delicate French Chantilly lace embroidered in a unique technique that allowed the beads to reflect more light. The color of the dress was dusty rose with a light ivory French lace. The embroidered mermaid corset dress was worn with a large top skirt with a belt that matched the gown. "It was a beautiful overlay to the dress, which I removed the reception," said Teresa. Pinned on the inside of Teresa's dress was an evil eye from her sister and a scissor pin from her uncle who died. She also used a cathedral-length veil that matched her bridal gown along with Jimmy Choo shoes. Her bridesmaids wore navy blue Dora cap sleeve gowns and the flower girls sported Amalee lace and tulle dresses. Both mothers decided on Stephen Yearick gowns purchased at Bridal Reflections 5th Avenue Salon. Bridesmaids carried beautiful vendella roses with moms using clutch bouquets of the same flowers. 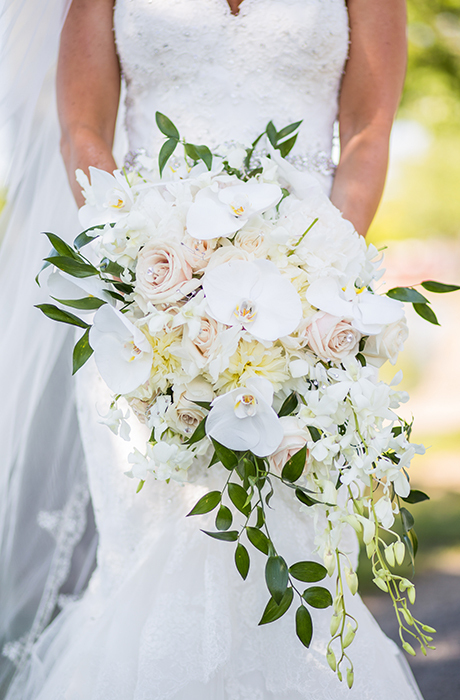 The bride's bouquet was orchids, garden roses and vendella roses. The flower girls had mini-clutch versions. 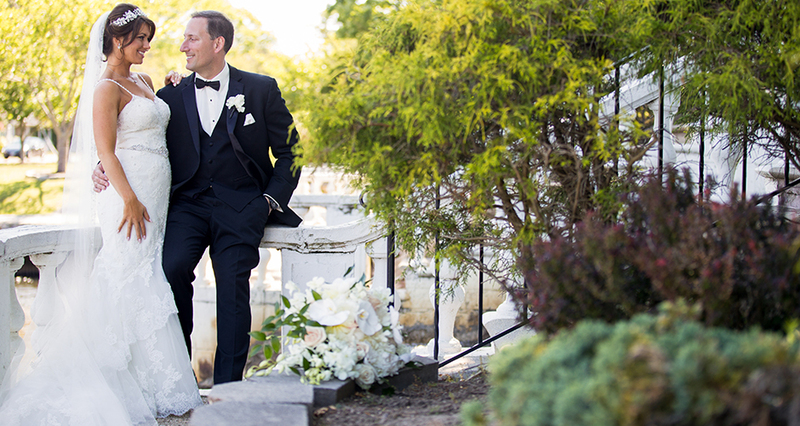 The groom wore a black custom tuxedo, a white tuxedo shirt, a black bow tie and Ferragamo tuxedo shoes. 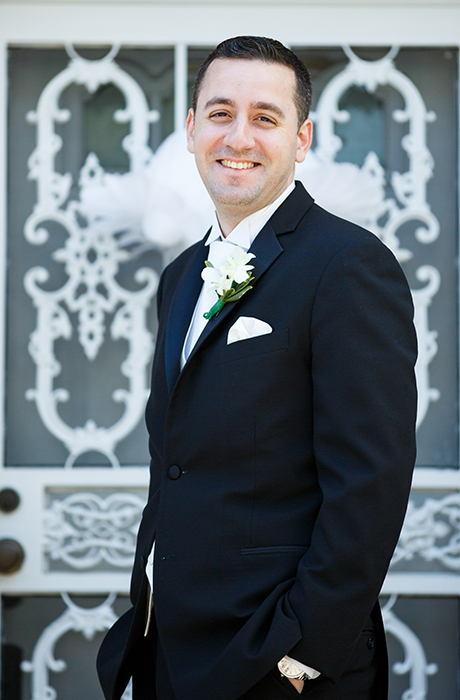 Enrico changed his look for the reception by donning a custom white satin with black trim smoking jacket. His groomsmen wore blue/black European tuxedos with white shirts and black bowties. The church was decorated with tall pillar flowers and a customized runner with their monogram. 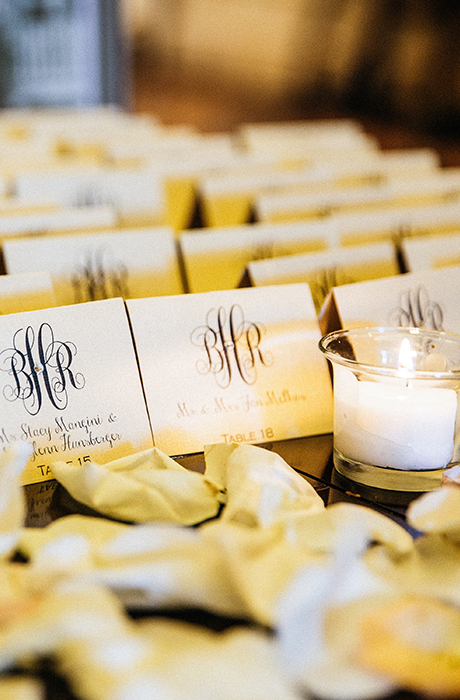 Each guest received a monogrammed church program with a tissue in the back. The couple's families were involved in the ceremony, with cousins on both sides doing readings, their godparents bringing gifts to the altar and Teresa's father walking the bride down the aisle. After exiting, church guests received a pouch with Italian confetti candy and the bridal party launched rose petal cannons. 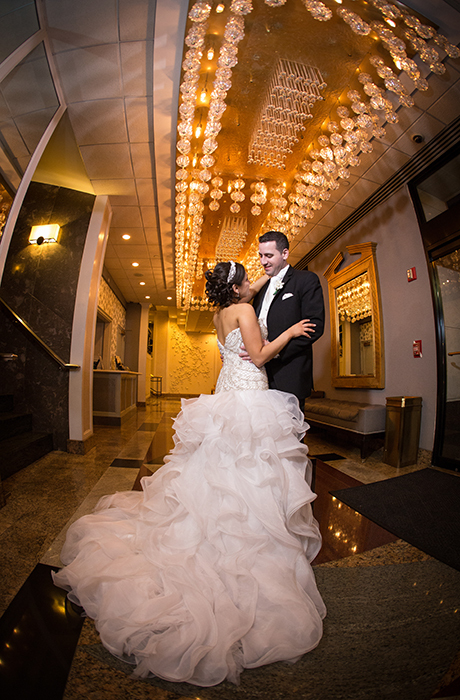 Teresa and Enrico chose The Garden City Hotel for their wedding. The cocktail hour took place on the hotel's main floor. Guests were greeted by sweet piano music, champagne and a beautiful table filled with flowers and candles. Attached to all name cards was a vintage gold love key and a sign on the table that read, "Please find the key to your seat to unlock a night full of memories." Throughout the cocktail hour, there was a three-string quartet. The main reception was in the ballroom, which was decorated with centerpieces made of vanilla roses, white orchids and beautiful candles. All the centerpieces had hanging table numbers. 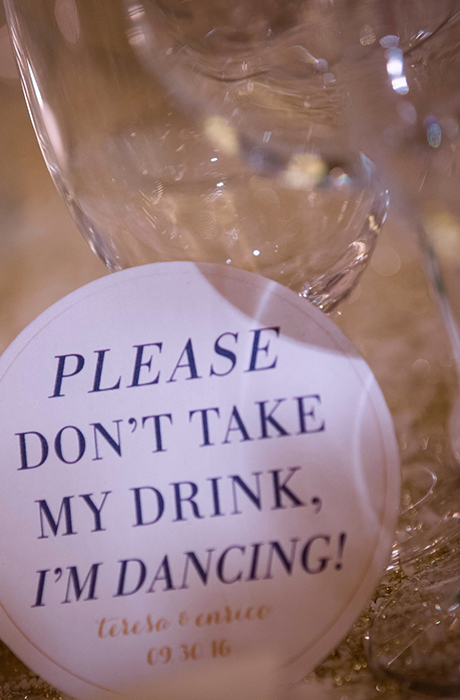 At each setting, there was a custom menu and a drink coaster that said, "Please don't take my drink while I'm dancing," which guests could leave on top of their glass. Guests were served a sit-down dinner, which included a combo appetizer (ripe tomato and burrata), a gnocchi pasta (ricotta, gnocchi, prosciutto, spinach and fresh tomato basil), a main entree selection (choice of ginger marinated sea bass, grilled filet mignon, lemon garlic roasted chicken) and desserts such as a mini crème brulee, fried Oreos, zeppoles, cheesecake lollipops and mini ice cream sorbet cones. 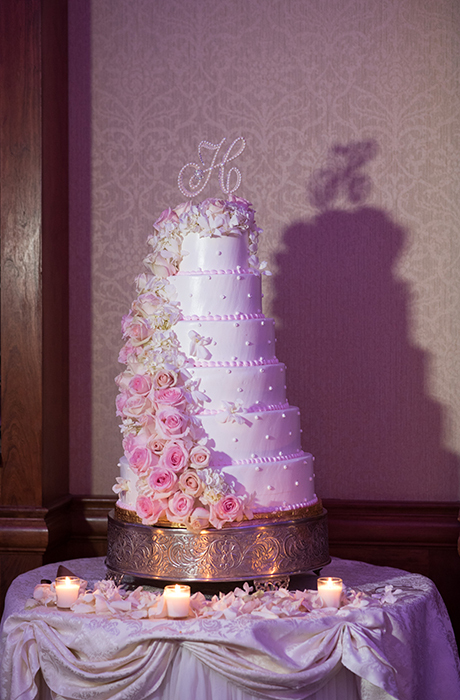 Teresa and Enrico's vanilla cake was made by the Garden City Hotel and was filled with chocolate ganache and featured handmade sugar flowers in between each layer as well as a gold monogram. Some fun wedding touches included a Frank Sinatra singer during dinner, and an open-air photo booth to take fun pictures throughout the night. At the bar, signs indicated a hashtag guests could use for Instagram. Favors were Lenox servers in silver metal from the Organics bead collection. Guests could also make a confetti candy bag using five different flavors of Jordan almonds, from strawberry to zuppa inglese to tiramisu, which symbolized wishes, such as love, happiness and health, for the bride and groom. For their honeymoon, the couple spent 13 days in Hawaii visiting the islands of Maui and Kauai. "You can't control everything ... when that day comes, only you will notice the little things that others won't at your wedding," said Teresa. "It rained on my wedding day, but it didn't change one thing ... about marrying my husband and my best friend. I let the sunshine radiate through my smile through the entire day." 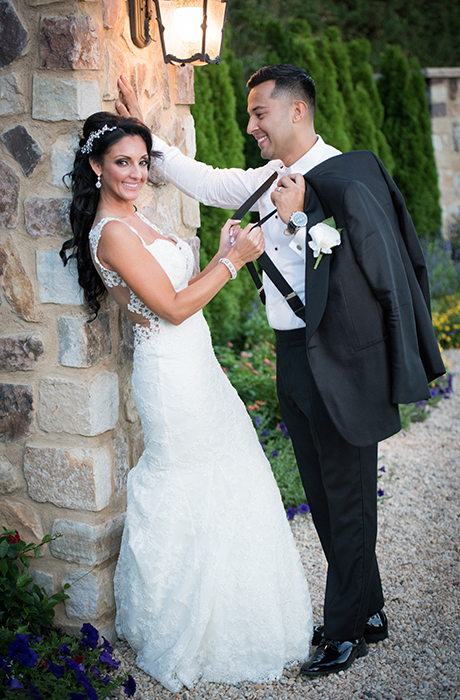 Teresa wore a custom Galia Lahav Crystal dress. The gown was made of a delicate French Chantilly lace embroidered in a unique technique that allowed the beads to reflect more light. 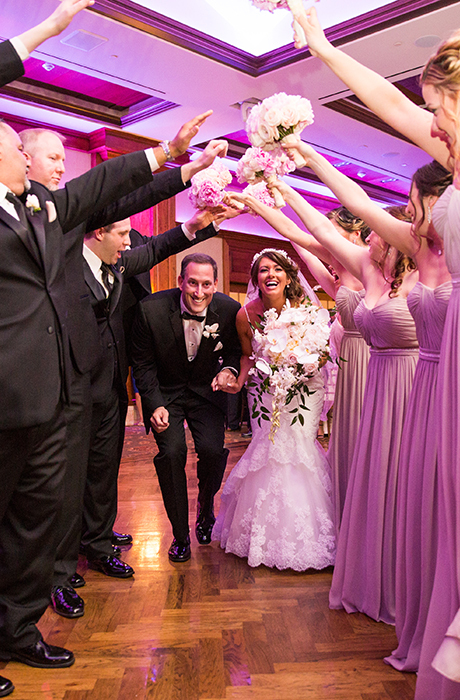 The color of the dress was dusty rose with a light ivory French lace. The embroidered mermaid corset dress was worn with a large top skirt with a belt that matched the gown. "It was a beautiful overlay to the dress, which I removed for the reception," said Teresa. SOMETIMES YOU MEET YOUR MATCH through the people you've known for years. "A friend of mine was having a get together at her house one night and her boyfriend was bringing a friend everyone else in the group knew, but I hadn't yet met," says Annalisa. "Once I met him I knew there was something special about him." Vincent knew that there was something special about Annalisa as well, and after six years of dating he was ready to pop the big question. "Whenever we had free time and the weather was nice, Vincent and I would take walks through Eisenhower Park," says Annalisa. "One particular spring day after work, Vincent suggested that we go for a walk in the park." Annalisa and Vincent strolled to the rose garden and relaxed on a bench, where Vincent began to express how badly he felt about not giving her a gift for her birthday the previous week. Vincent proceeded to take his iPad out of his backpack and played a slideshow of photos of the two, over the past 6 years that he had put together. The photo montage, was accompanied by romantic music, such as John Legend's "All of Me". The last photo was of Vincent and Annalisa's father which had been taken the day he asked her father permission to marry Annalisa. "After the photos, the screen showed a message saying how much he loved me and then he got down on one knee and proposed. With lots of tears, I said 'Yes'!" 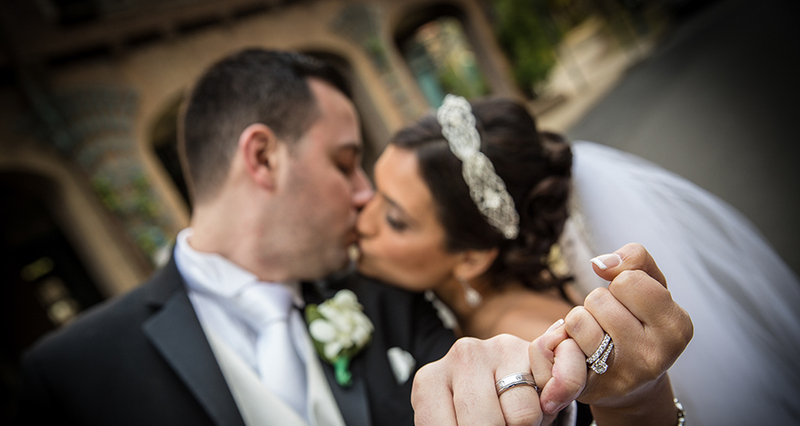 Annalisa and Vincent had a traditional Roman Catholic ceremony that was in both English and Italian. "Our heritage is very important to us, especially since I was born in Italy," says Annalisa. "My godmother came in from Italy for the wedding and recited a reading in Italian." 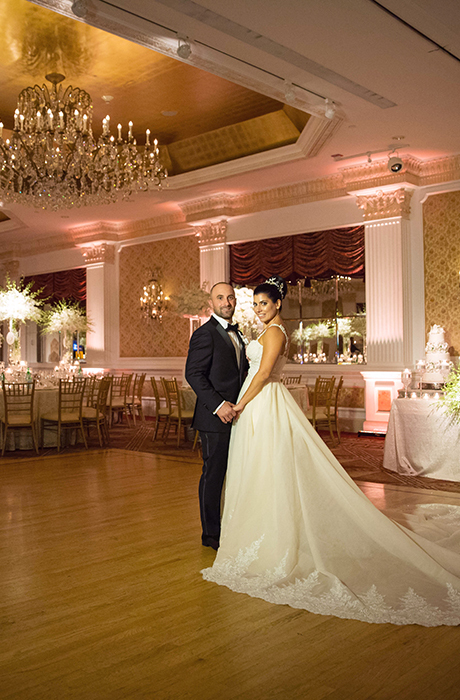 Annalisa wore a custom-made gown by Galia Lahav, which featured a detachable dramatic ball gown overskirt that she took off for the reception. Her dress was accessorized by pearl stud earrings given to her by her godmother, a bracelet borrowed from her sister who wore it on her own wedding day, and Christian Louboutin shoes. The bride's attendants included her bridesmaids, dressed in graphite trumpet-silhouette dresses with a sweetheart neckline. The flower girl complemented the bride's look in a tulle, lace tea-length dress and carried a mini version of Annalisa's bouquet. Her handsome groom wore a b lack Hugo Boss tuxedo and a white bowtie. His groomsmen were decked out in black Michael Kors tuxedos and bowties. After the ceremony, the couple rode off in a white Bentley Flying Spur to the reception at Harbor Club at Prime in Huntington. The reception started off with a cocktail hour on the balcony overlooking Huntington Harbor and followed with dinner and dancing in the main ballroom. 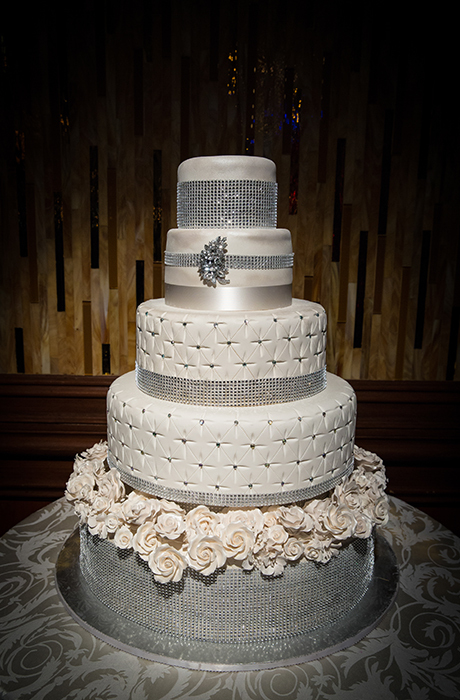 The decor's theme was white, gray, and silver with lace accents. 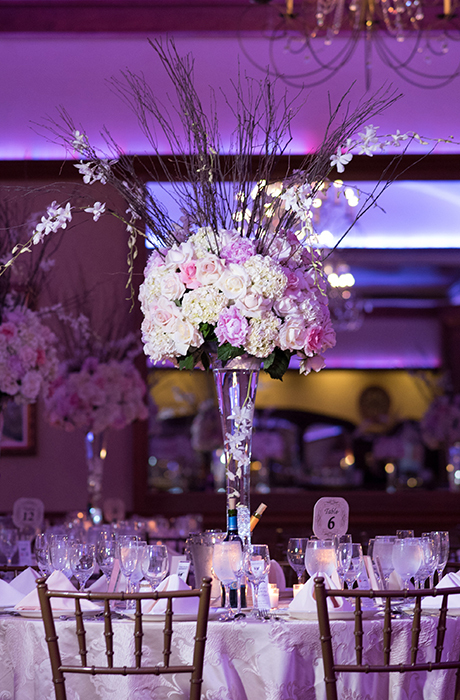 The tables were decorated with tall centerpieces of white Phalaenopsis orchids and hydrangeas accompanied by floating candles. 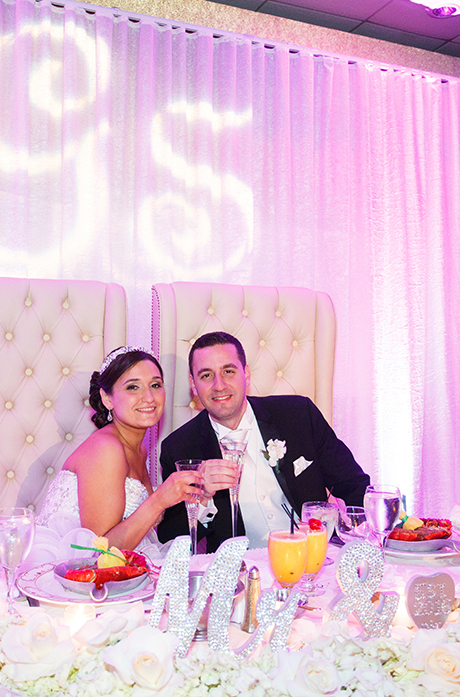 "We were introduced as Mr. and Mrs. Vincent Cice and then the party officially started!" says Annalisa. The newlyweds shared their first dance to "You & I" by John Legend and later did a spotlight dance to the English/Italian song, "I Belong to You" by Eros Ramazzotti and Anastacia. The bride and her father danced to the Italian song "Un'Emozione Per Sempre" by Eros Ramazzotti, and halfway through the dance Vincent and Annalisa's mother joined them. Vincent then danced with his mother to "Count on Me" by Bruno Mars and Annalisa and Vincent's father joined them on the dance floor. The guests dined on appetizers of warm goat cheese salad and crab cakes with a choice of Chilean sea bass, roasted chicken, veal osso buco, and prime New York strip steak for the main course. 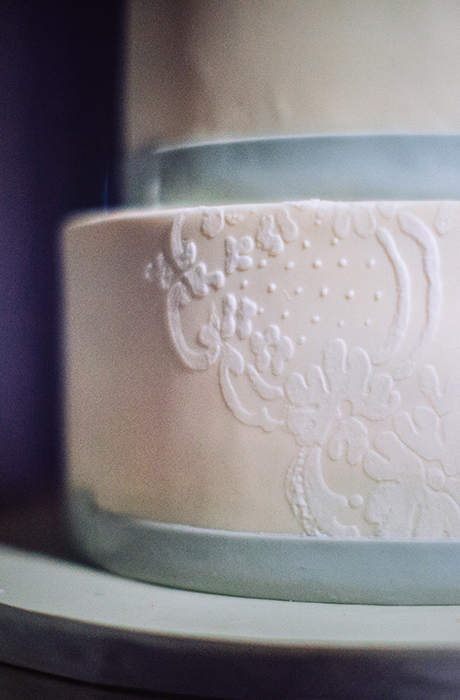 They were then treated to a three-layer funfetti wedding cake with vanilla buttercream filling. The party continued until the couple made their exit to prepare for their 1 0-day Hawaiian honeymoon. "We spent five days in Kauai and five days in Maui, says Annalisa. 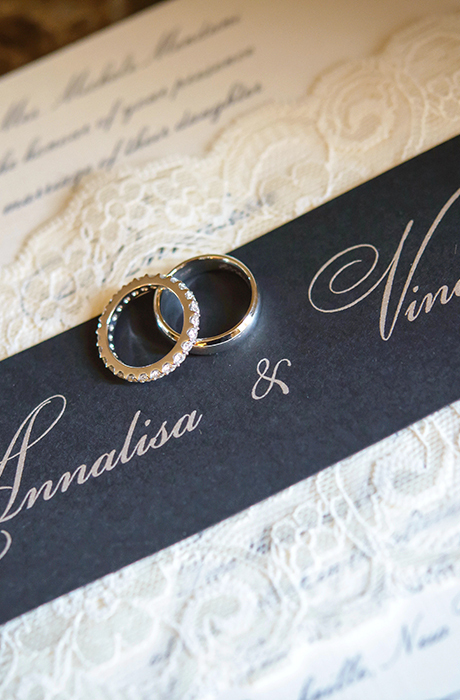 Annalisa and Vincent had been planning their big day for almost a year and a half. This was the moment they've been waiting for. 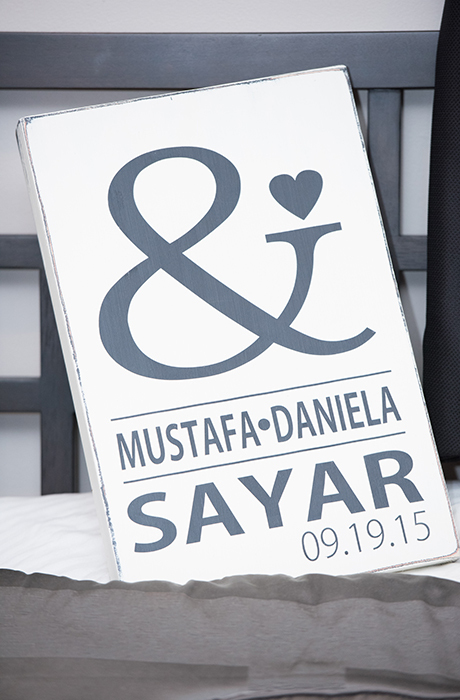 "My favorite memory of the d ay was walking down the aisle of the church and seeing Vincent and his beyond happy expression at the end waiting for me," says Annalisa. Vincent's words of advice to other husbands-to -be? "Happy fiancé, happy wedding planning!"